Home › Questions and Answers › Should Mark 16:9-20 be part of the Bible? Should Mark 16:9-20 be part of the Bible? Some have wondered if Mark 16:9-20 should be part of the Bible (a related video is also available Should Mark 16:9-20 be in the Bible?). Are the last twelve verses or Mark’s Gospel inspired? One of the most controversial points or Scripture is whether Mark 16:9-20 is actually a part or Scripture. Although it appears in the King James Version, many other translations either label this section as an appendix or leave it in the footnotes as in the controversial Revised Standard Version or the Bible. The Moffatt Translation, together With the Goodspeed and others, not only has the long ending round in the King James Version, but it also has another shorter ending. Since the Bible is a revelation from God about those essential facts which we need to know, but which we have no other way or obtaining, it is very important that we know what constitutes the Bible. If this last portion or Mark’s Gospel is spurious, it is time we learned of the fact. If it is genuine, it is vital that we believe what it contains. Let us briefly understand the facts behind the controversy. The eighth verse of Mark, chapter 16, ends abruptly — seemingly at a place where it would be natural to have the thought continue. Why? There have been two reasons generally postulated. (1) That Mark originally wrote an ending that has been totally lost, the present endings being merely additions by later copyists. (2) That for some yet unknown reason Mark was not permitted to finish his Gospel, and that probably another person wrote an ending. The scholars are, of course, in confusion as to whether this ending was inspired, or whether it was merely the addition or another copyist. It might be important to bring in at this point the fact that almost all scholars dismiss the secondary short ending found in the translations of Moffatt, Goodspeed, and others. In Hasting’s Dictionary of Christ and the Gospels it is plainly stated that this short addition is not found in any of the early Church writers. We can therefore consider it as merely the addition of a copyist. These facts point plainly to the great antiquity of the longer ending as preserved in the common English versions. But were they inspired? Let us consider now the common idea that the real ending of Mark was lost. Since the Bible explains that the Word of the Lord endures forever, are we to assume that so important a matter as the resurrection was allowed to perish? Notice chapter 36 of Jeremiah, verse 23. Here one of the scrolls containing the inspired words of the Lord was cut with a penknife and cast into a fire and totally destroyed. Did God leave it to some copyist to guess what it might have contained? No! Baruch, the scribe of Jeremiah, was ordered to write in a new scroll “all the former words that were in the first roll” (verse 28). So one of the basic principles is that God’s inspired Word can not perish. Now turn to Mark 16. Since God does not allow His Word to perish, it is logical that there never were added verses now lost. The answer is definitely that it is an INSPIRED ending. But not all accept that. Mark gives no accounts of anyone seeing Jesus as Matthew, Luke, and John later report. In fact, according to Mark, any future epiphanies or “sightings” of Jesus will be in the north, in Galilee, not in Jerusalem. Well, that is partially correct. But, because it is missing certain information, there are reasons to doubt the conclusion as the evidence is not clearly against it. Papias claimed to know at least some of the original apostles as well as considered to be a companion of Polycarp of Smyrna. This is the first reference we have to Mark and a gospel, and it is considered to be accurate. “And” is not in the original Greek (9999 means that there was no Greek word–the other numbers refer to a numbering system of Greek words used in Strong’s Exhaustive Concordance). Thus, Justin’s writing seems to at least an implied be early confirmation of Mark 16:20. 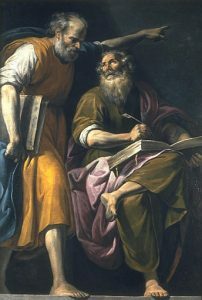 While Dr. Tabor referred to Clement and Origen of Alexandria, it should be noted that they both had trouble with gnosticism and other matters, and their lack of comment on these verses does not necessarily prove that they were unaware of them (though in Origen’s case, as he commented about a lot of scripture, it suggests that Alexandria may not have had the full version of Mark’s gospel). It should also be noted that Origen had the false ‘Gospel of Peter,’ thus since he did not know the true Bible, it is not a surprise that he might not have had all of Mark’s Gospel in the third century (see also The New Testament Canon – From the Bible and History). The part I bolded above is what is written in Mark 16:19. This writing would be in the late second century, several decades from the time that Papias wrote. Furthermore, since Irenaeus also claimed to have known Polycarp, it is logical to conclude that he could have used the same account by Mark that Polycarp and Papias would have used. By mentioning the term “canons,” the Harris Fragments seems to be suggesting that John passed the knowledge of the proper books of the Bible to Polycarp–and that would seem to be the case. Irenaeus, then, may have gotten the correct ending of Mark from Polycarp. Since Irenaeus quoted Mark 16:19 in the 180s A.D., this passage does not seem to be a third century or later addition as various critics of Mark 16:9-20 imply. Consider, also, that most books of the New Testament, and all the other gospel accounts end with the word “Amen.” It is logical that Mark’s account would as well. It is not likely that it stopped abruptly with Mark 16:8. As far as details of the resurrection go, the account at the end of Mark’s gospel ties in with the other gospels. For details, see What Happened in the ‘Crucifixion Week’? Furthermore, in the book of Acts we see many of the signs that are mentioned in verses 17 and 18 confirmed. For example, “they will cast out demons” is shown in Acts 16:16-18; “they will speak with new tongues” is shown in Acts 2:4; 19:6; “they will take up serpents … it will by no means hurt them” cf. Acts 28:3-5; “they will lay hands on the sick, and they will recover” is shown in Acts 28:8. Though we do not have a scriptural account of “if they drink anything deadly, it will by no means hurt them,” we do have an account outside of scripture that the Apostle John was put into a pot of boiling water and that he was unharmed (see Polycarp, Fragments from Victor of Capua). It was claimed by Tertullian in the 3rd century (Tertullian. The Prescription Against Heretics. Chapter 36. Translated by Peter Holmes. Excerpted from Ante-Nicene Fathers, Volume 3. Edited by Alexander Roberts and James Donaldson. American Edition, 1885) that this is why John was then exiled to the island of Patmos, which he mentions in Revelation 1:9. History also indicates that the apostles “went out and preached everywhere”(Mark 16:20) as they proclaimed the gospel in various lands–not only the Middle East, but Europe, Asia (India and perhaps to Malaysi), and parts of Africa (for some details, see The Ephesus Church Era). It may well be that Papias related this in order to show that Mark 16:18 had been shown to be accurate. Thus, the evidence of the inclusion of Mark 16:9-20 pre-dates the ‘evidence’ of its non-inclusion. The signs of Mark 16:17-18 did follow the apostles and they did preach all over (for some details, see The Ephesus Church Era)..
A group of manuscripts known as “Family 13” adds Mark 16:9–20 in its traditional form. Including about a dozen uncials (the earliest being Codex Alexandrinus) and in all undamaged minuscules. Uncials: A, C, D, W, Codex Koridethi, and minuscules: 33, 565, 700, 892, 2674. And it is likely that it was in the Vulgate because the Catholic doctor and saint Jerome felt it was legitimate. Eusebius of Caesarea (A.D. 339), as well as Jerome (A.D. 420), are said to have indicated the absence of the verses from almost all Greek manuscripts known to them. However, it should be noted that the statement made by Eusebius occurs in a context in which he was offering two possible solutions to an alleged contradiction (between Matthew 28:1 and Mark 16:9) posed by a Marinus. One of the solutions would be to dismiss Mark’s words on the grounds that it is not contained in all texts. But Eusebius does not claim to share this solution. The second solution he offers entails retaining Mark 16:9 as genuine. The fact that he couches the first solution in the third person (i.e., “This, then, is what a person will say…”), and then proceeds to offer a second solution, when he could have simply dismissed the alleged contradiction on the grounds that manuscript evidence was decisively against the genuineness of the verses, argues for Eu­se­bi­us’ own approval. The mere fact that the alleged contradiction was raised in the first place demonstrates recognition of the existence of the verses. Thus, some of the reasons proposed to exclude Mark 16:9-20 do not seem to hold up well to additional scrutiny and nearly all manuscripts actually do support the inclusion of those verses. What about the writing style objections by scholars like Dr. James Tabor? As one who has written thousands of articles, I know that my own writing style can verify, especially in longer documents–that could have been the case with Mark. That being said, it may well be that a writer other than Mark ended up finishing the Gospel account credited to him. If so, that would have in the first century A.D. Nor would that be impossible from a scriptural perspective. For example, the first five books of the Bible, sometimes called the books of Moses, have an ending in the Book of Deuteronomy that Moses could not have written, as he was already dead (cf. Deuteronomy 34:5-12). It may well be that someone else, like perhaps Peter (who some believe dictated the gospel to Mark to write) or the Apostle John (believed to have been the last of the original apostles to die as well as the one who would have essentially canonized the New Testament (see also The New Testament Canon – From the Bible and History) may have written the last several verses to Mark. If so, that would account for the stylistic differences (though the fact is that the same writer often has different writing styles, so Mark may have written the ending). Although some object to Mark 16:9-20, evidence supports that it is scriptural and should be part of the Bible. This article shows from Catholic accepted writings, that the Old Testament used by non-Roman Catholics and non-Orthodox churches is the correct version. Is Matthew 28:19 in the Bible? Some have claimed that Matthew 28:19 has added words as part of a trinitarian plot. Is that true?